You'll be £6.00 closer to your next £10.00 credit when you purchase The German Army from Mobilisation to First Ypres. What's this? This new volume in the long-running Images of War series features the actions of the Imperial German Army at Ypres from 1914-15. In the autumn of 1917 Captain Otto Schwink, a General Staff Officer, by order of the Chief of the General Staff of the Field Army, produced a book entitled The Germans at Ypres 1914. Herr Schwink's text is reproduced accompanied by rare photographs illustrating the Imperial German Army as it was in the pre-war era and in the field during the campaign, which culminated in the four year struggle for the Ypres salient. Photographs depict the troops, officers, supporting artillery, High Command and the events of the 1914 Christmas truce. This volume also features a chapter on Adolf Hitler's service during the Great War, which both began and ended in the Ypres salient, and includes a selection of rare photographs illustrating Hitler's experience in the ranks of the Bavarian Army in Flanders. 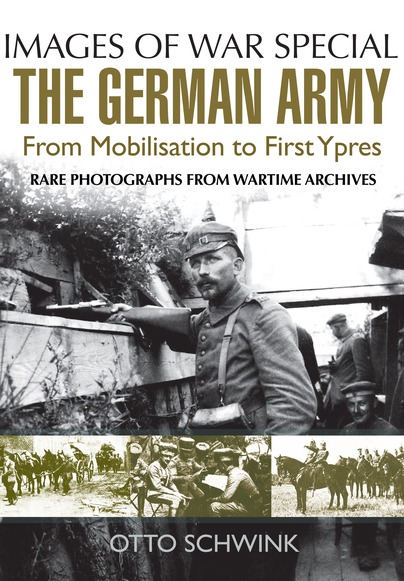 In this new volume THE GERMAN ARMY, FROM MOBILIZATION TO FIRST YPES of the series IMAGES OF WAR, Otto Schwink presents a collection of rare photographs captured by orders of the German General Staff and which was intended to keep the German people informed on the progress of the war. The book covers the period from mobilization to the first battle of Ypres, the importance of which lies in the stark contrast clearly observed between the first days of the Great War and the stalemate reached a few months later. The book shows the German army in the commencement of hostilities as the well trained, well equipped, highly enthusiastic, formidable fighting machine. The contrast is quite visible in the photographs depicting the battles, the trenches and the destruction which followed. Another set of photos shows the importance attached to cavalry at the beginning of the war which was soon rendered obsolete with the efficient use of the machine gun. The beauty of this volume also lies in the selection of photos showing the technological advances which marked the start of a revolution in the way warfare was conducted in the Great War. The advance of radio communication, zeppelins, mobile artillery, mobile transport and machine guns are nicely depicted. I highly recommend this book to anyone interested in the Great War and especially the German Army at the early stages. A great book for anyone with an interest in the First World War, or indeed the history of the German army. Also, it is a fitting reminder of the early days of the war. An interesting book which covers the early part of WW1 and even more so for looking at the German side of things with text that did just that yet was recorded shortly after the actual events took place. Add the interesting selection of over 190 photos which give lots of details for modellers to enjoy, another good WW1 addition to the popular Images of War series. Captain Otto Schwink was a serving officer in the German Imperial Army during the Great War of 1914-18. As a result of his close involvement in the 1914 campaign and his exceptional writing ability, he was selected by the General Staff to produce an official publication dealing with the events of 1914 from the German perspective, which was destined to become one of the first examples of wartime propaganda in book form from the German perspective.